Do you believe in miracles? Well, I’m not talking about the miracles that we read in religious books, but some unexpected events that completely change the course of your life. My name is Sharukh Bamboat and I’m one of the co-hosts of the Cherished Blogfest 2016. This will be the second time I’ll be co-hosting this blogfest along with Dan Antion, Damyanti Biswas, Mary Giese, Peter Nena, Cheryl Pennington and Kate Powell. As many of you already know, I usually write on India Destinations where I showcase some of the destinations, food, and festivals in India. However, before I started writing my travel blog, I was a professional content writer and I still earn my living as a freelance content writer. I usually get very little time to write for myself which is why I usually don’t write 3-4 times a week like most bloggers do and I have no regrets because I don’t want to write just for the sake of writing. Last year when the concept of co-hosting the blogfest was mentioned to me, I was excited, nervous and skeptical. It was a new ground for me. I’m not a very social person. I am shy, reserved and usually invisible online. However, I liked the idea and I readily jumped in to support my co-hosts. While we were still in the preparation mode, we were surprised at the positive response that we received and more than 100 bloggers joined in to participate in the blogfest. For me, it was nothing less than hosting a movie award night. I was paranoid and super excited because I usually don’t interact with so many people and now I had to do it because I was one of the co-hosts. I wrote my Cherished Blogfest post and got busy reading what others had written. It was a great experience because everybody was sharing about moments and things that have stayed in their minds and hearts forever. Some posts were good, some were highly emotional and touching and some were straight to the point, but every blog post had something unique about it. As a writer, it was a great experience to know and understand how human beings are attached to things, incidents and memories. However, more than reading the blog posts, it was the social experience that I enjoyed the most. If you are a reserved and shy person like me, this is the perfect opportunity for you to open your heart and meet people who are just like you. For me, the Cherished Blogfest was a giant leap forward into the world of social interaction. I made blog friends who have stayed with me till date and I got the opportunity to share my thoughts and views and in exchange learn new things from them and understand their perspective of life. It was a fruitful and enriching experience that certainly changed the way I blog now, it has also impacted me as a human being because I now interact with more bloggers who have their own knowledgebase and experiences to share. If you missed out being the part of the Cherished Blogfest last year you can become a part of it this year. 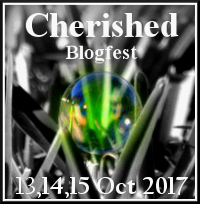 All you need to do is sign up and place the Cherished Blogfest badge on your blog’s sidebar and help us spread the word on the social media. You may use the hashtag #CBF16. Join us on the 29th, 30th and 31st of July, 2016 and write your 500-word story of one of your cherished objects on your blog. If you want more information about the blogfest, click on the “Cherished Blogfest” menu option. If you want to sign-up now, Click the link below. This entry was posted in #CBF16, Testimonial and tagged #CBF16, #cherishedblogfest, Cherished Blogfest, Experience, Testimonial on July 6, 2016 by Dan Antion.